Is It Time for a Social Media Clean Up? Our online lives get just as cluttered as our homes do, only it’s much harder to spot on the internet. Whereas a mountain of unfolded laundry is hard to miss, social media disorganization isn’t tangible and can go unnoticed for a long time. And just because it’s not obvious, that doesn’t mean it’s not causing problems. It’s been suggested there’s a strong connection between clutter and psychological stress. A distracted social media manager is a liability and can result in missed messages and inconsistencies in tone or delivery. An organized approach to social media gives you more control and better quality content, which leads to stronger connections with your audience. You probably do some form of spring cleaning at home, and you can use that seasonal motivation to freshen up your social media presence. Our social media clean up checklist will help you enter the new season with a renewed strategy. Social media is light-hearted and fun, but it also has a measurable impact on your bottom line. Your social media strategy should support the objectives of your business. In order to be successful, find out if your existing social strategy is working for you. The first thing you should ask yourself is: Have your goals changed since the previous year? If so, then you need to ensure your social media presence supports your new objectives. The platforms you’re currently utilizing might not be the best suited for your updated needs. A great way to determine if you’re in the right place is to perform a social media audit. It’s not as daunting as it sounds, we promise. 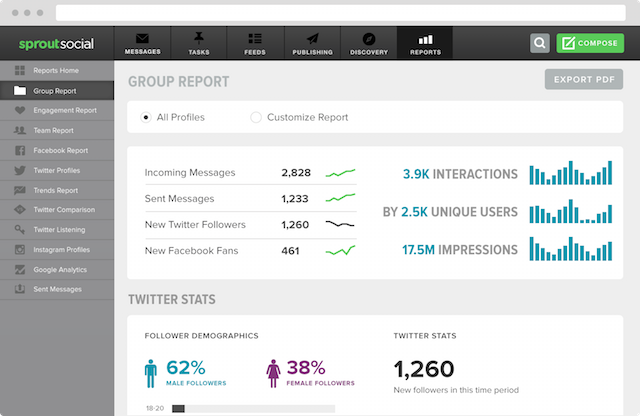 Take stock of your social presence across the Web. Determine if your team is spread too thin across too many channels. Identify inactive accounts or irrelevant platforms. Ensure consistency across account handles. As new social networks and apps appear, it’s common practice for businesses to create an account in order to reserve their name. Sometimes these accounts go on to become viable social media presences, while others remain dormant. If you’re not using it, now is the perfect time to discuss with your team whether it’s worth keeping. Your time and energy is valuable so make sure it’s being directed to the right places. While choosing the right social media networks is important, so are the metrics you’re tracking. Social media metrics are key indicators of whether your efforts on a particular platform are paying off. By tracking the right analytical data, you should be able to summarize growth, performance, engagement and audience demographics. If you’re unsure about a certain channel, take a look at its metrics and determine if the platform supports your objectives. And if your goals have changed, chances are you’re metrics will too. Everyone defines success differently, and depending on what you’re hoping to achieve, certain metrics will paint a clearer picture of where you stand. Are the metrics we’re monitoring the best ones? Do they align with our new objectives? Was something lacking from last year’s reports? What metrics can we include to add more value? Social media metrics are the best way to gauge your overall success online. Make sure you’re kicking off the spring season armed with the strongest analytics. Where and how you’re reaching consumers is just as important as who you’re reaching. If you don’t already have a target audience defined, now is the time to do so. In fact, this will significantly guide your social strategy moving forward, so it’s critical to have this key component in place. Whether you have one or are creating one for the first time, make sure your target audience is active on the social platforms where you’ve established a presence. If you’re pushing content on Facebook, but your key demographic primarily uses Twitter, then your message isn’t being delivered to the right people and your goals won’t be met. You’ll also want to come up with segmentation strategies for larger, more diverse social networks. You might have 1 million fans on Facebook spread across the US. If your business is local, then customers in Austin won’t care about promotions you’re running in Chicago. Make sure the appropriate message reaches the right people by segmenting your audience and applying targeting parameters to your posts and ads. 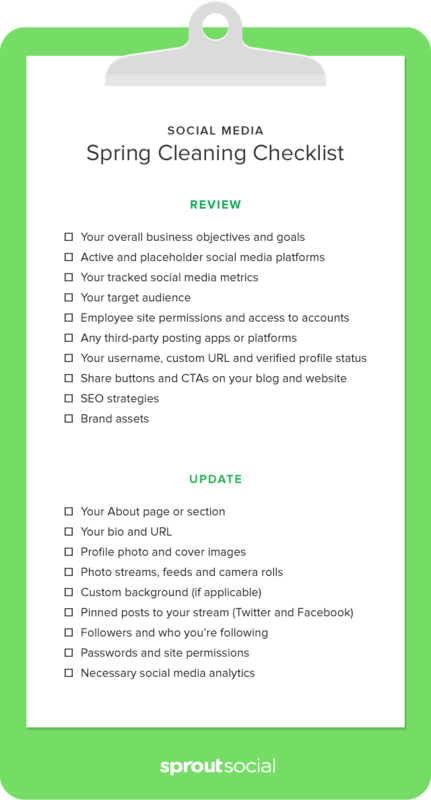 With Sprout Social’s social media management tools, you have the ability to target your audience across each unique social media platform. It’s easier to reach your audience with the same voice for each network. Who Has Access to Your Accounts? Since you’re already digging into your social channels, now is a great time to think about who has access to these accounts. Over the past year, people may have changed roles or left the company. Review employee permissions and make sure only the right people are able to access your accounts. 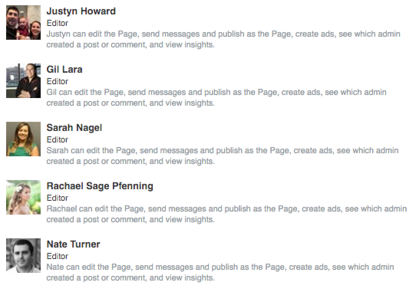 Specifically on Facebook, you’re able to grant various permissions to admins. Review those settings and make sure people have access to what they need in order to do their job efficiently and effectively. Even if other social networks don’t have individual admin permissions, you should still look over permissions. This is also a great opportunity to look over your employee social media policy and make any necessary revisions. Last but not least, take a look at which third-party apps have access to your channels and their permissions. If you haven’t used an app in a while, get rid of it. On Twitter, for example, just go into your Settings and click Apps to view all of the apps that have access to your Twitter account. There’s more to your social media presence than what we’ve covered so far. Let’s build upon the master list you created as part of your social media clean up and look at some of your assets. The very first thing you’ll want to do is make sure your handle or username is consistent across channels. Similarly, if the platform you’re on allows for custom URLs, are you using the same identifier in all of your URLs? And if you haven’t already, check to see if you’re eligible for verified profile status on Twitter, Facebook and Instagram. Don’t forget to look at the URLs you’ve added to your bios. Make sure that it’s working and still relevant. Next look at the visual assets you’re using. Is your profile picture and cover photo up to date? Have you made any changes to your logo that hasn’t been reflected in these images? Maybe you’ve been using the same image or background for too long and it’s time for a refreshed look. As you go through your channels, make notes of which ones need updated images. You’ll want to stay consistent. So if you make a drastic change to one social profile, apply it to all of them. 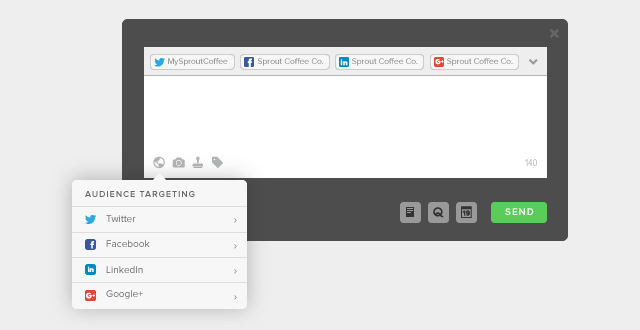 Additionally, you can use Sprout’s newest image resizing tool, Landscape. 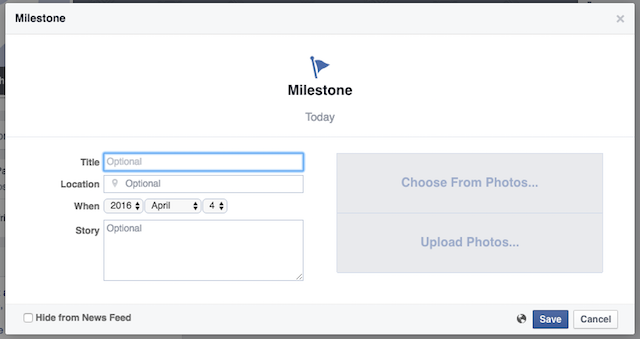 This free tool allows you to scale, crop and adjust your images to fit perfectly across all your social networks. 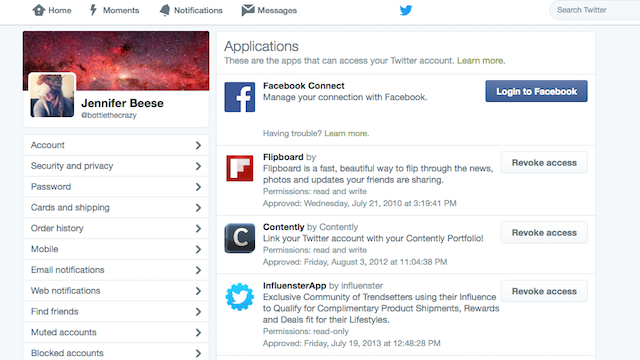 Certain social networks let you pin content to the top of your feed. If this is something you utilize, make sure that whatever is pinned is still relevant. Open your Twitter Profile page. Choose the Tweet you’d like to pin. Select “Pin to your profile page”. 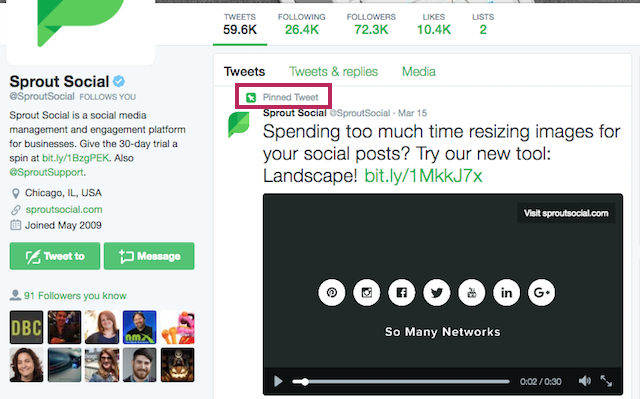 The Tweet will automatically appear at the top of your Twitter stream until you change it out. When you’re ready for a change, either choose to unpin the existing Tweet or follow the steps above on a new Tweet to replace the existing one. You can do the same thing on your Facebook Page. Click “Offer, Event +” at the top of your Page’s Timeline. Add a title, location, date and details. Throughout the year you make tons of social connections. Spring cleaning is the perfect time to review your fans and followers and remove any inactive or spam accounts. This is more easily done on networks like Twitter and Instagram than it is on Facebook since you can’t remove a Like. You should also take a look at who you’re following as a business. Are there any new partners, collaborators or ambassadors you need to add to your list? On Facebook you can Like a Page as a Page. Are there any inactive Pages in this list that you can remove? Performing a social media clean up for all of your accounts shouldn’t be a once-a-year event. Think of it as routine maintenance. Just as you would get an oil change or visit the doctor for a check-up, you need to regularly check in with your social profiles ensure everything is running smoothly.